Mountain High’s $299 Anytime Season Pass sale is on now through April 15th and today the Southern California area added three new partner resorts to its 2013/14 season pass program; Timberline, OR, Schweitzer, ID, and Angel Fire, NM. Now, instead of one resort, Mountain High pass holders choose from seven different areas with more on the way. Click here for a complete listing of locations and benefits. Pass holders receive three FREE tickets to each partner resort each season. These tickets are valid Sunday through Friday, non-holiday, and additional discounts may be available for family & friends and visits exceeding the initial three. Please check each resort’s individual websites for holiday restrictions and special offers. Mountain High’s Anytime Season Pass is good any day or night the resort is open with no restrictions. At just $299 it pays for itself in just 5 visits. Additional benefits include FREE tubing at the North Pole Tubing Park, $10 Off Adult Ski/Snowboard Lessons, 10% Off non-sale retail apparel, monthly discounts for family and friends, early “ups” on select days, and the ability to TRACK your days ridden, runs per day, and vertical feet. Children’s Passes for ages 7 to 12 are also available for just $199 with the purchase of an adult season pass and $249without. (Regularly $279) Children six and under ski FREE when accompanied by a paying adult. Hurry, this special season pass offer is only available through April 15th, 2013! Anytime season passes will still be $299 for a limited time in the fall but the additional resort benefits will be part of a $50 upgrade. They will not be included in the traditional season pass purchase. 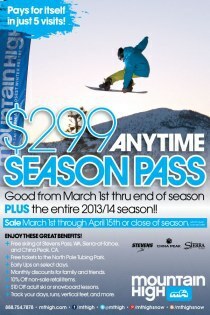 At $299 a Mountain High season pass is the best deal of any major resort in Southern California. Guests are encouraged to purchase their passes online at mthigh.com; however, passes can also be purchased at the resort and by phone at 888 754 7878. Please note there is a $10 processing for all new passes purchased. For more information or to schedule an interview, please contact John McColly at 760 316 7803 or john@mthigh.com. Mountain High is Southern California’s closest winter resort located just an hour and a half from Los Angeles and Orange County. The area consists of three separate mountains (Mountain High East, West, and North), and offers a wide variety of lifts and trails, a world-class terrain park, an outstanding Winter Sports School, and the region’s largest tubing area. Night skiing & snowboarding is available most evenings until 10pm and snowmaking covers more than 80% of the slopes. Mountain High has been the first resort to open in Southern California for the past 15 years and traditionally operates from mid-November to mid-April. Get more at mthigh.com.